HOW DO OTHERS REALLY VIEW THE PROJECTS THEY WORK ON? Imagine two computers, a Macintosh and a PC. Both can run “Microsoft Excel” and both can run “Adobe Photoshop” (graphics software), yet you cannot run software written for one type of computer on the other. And, even the same programs have a slightly different look and feel to them. Additionally Excel runs fast on a PC and a bit slower on a Mac, but Photoshop runs far faster on the Mac than on the PC. See the Benefits of CBCI™ Brain Communication Profiling. Our brains work in the same way. If we are genetically built to process information in a certain way and we are “forced” to swallow systems or procedures or management styles that are “designed” for a different brain processor, we tend to be less efficient and less fulfilled. Yet, if we have a greater understanding of the processor we are running in our brain, it becomes easier to design the right “so ftware” to do the job better and more effectively. The CBCI™ helps do just that. 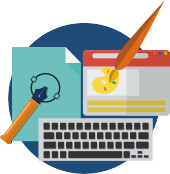 The second part of the profile also determines the areas necessary to gain more “Communication Flexibility” in order to work well with other types of brain processors. Besides identifying an individual’s genetic brain processing it indicates additional “learned” brain flexibility and areas where one may have difficulty in communicating with others. By identifying the fundamental patterns in the way our brain genetically functions, we overcome misunderstanding, conflict, and wastage of individual and group potential. The Directive Communication™ organization of the different colors of the brain in classification of “genetic neuro-processing” defines the way each person experiences their environment and takes in and interprets information, which results in specific ways of perceiving and evaluating events and situations. Certified Trainers of Colored Brain Communication are trained to clearly make these distinctions. 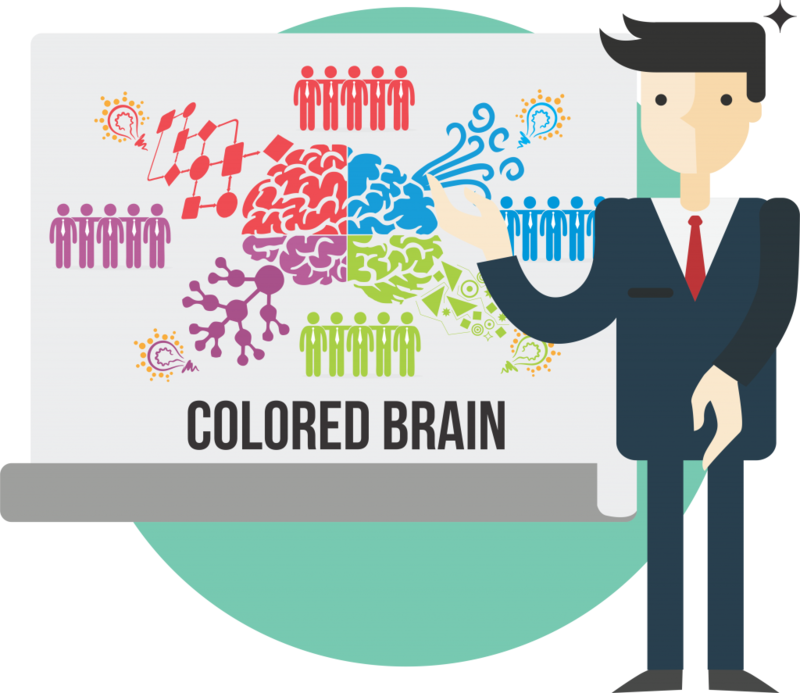 Find out more about becoming a Colored Brain Communication Certified Trainer. 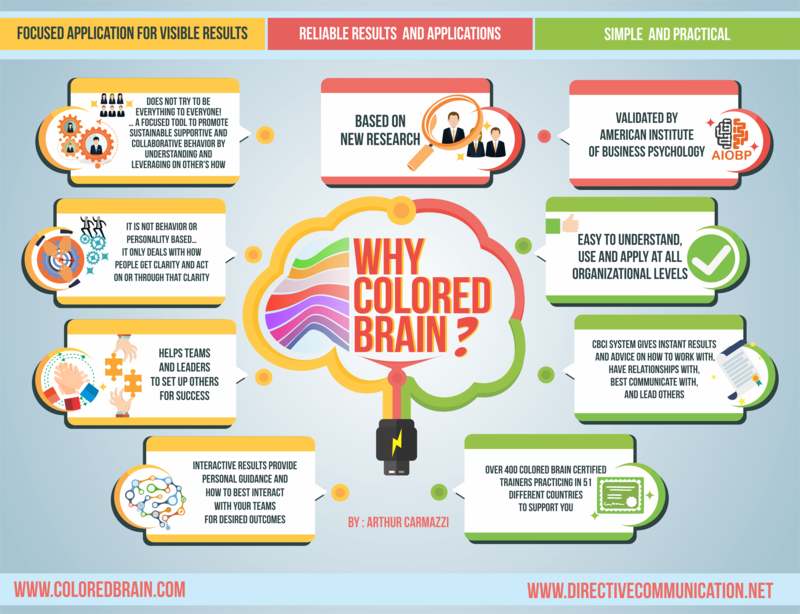 Colored Brain is Based on NEW Research! 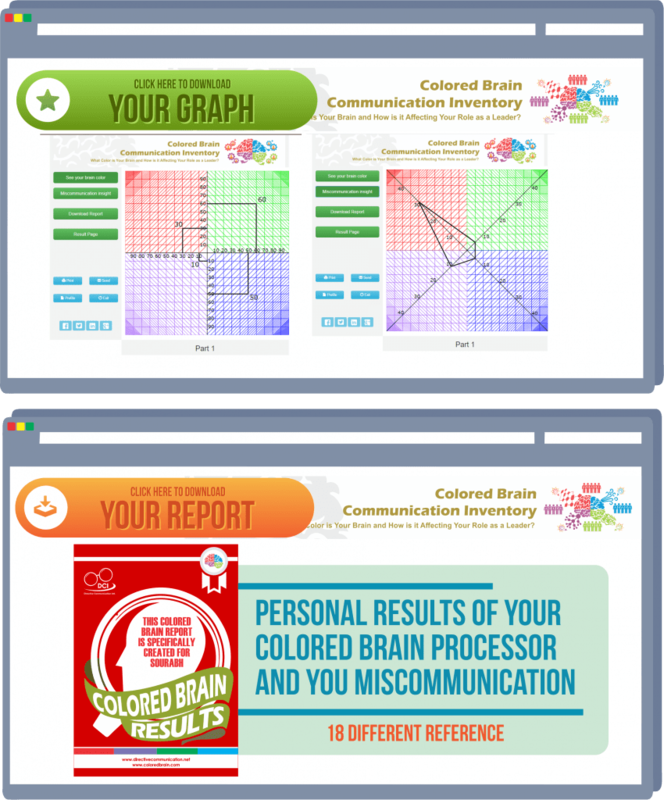 While so many psychometric tools are based on research that is 20 to even 70 years old, Colored Brain incorporates the latest research on Neuroplasticity, and the modern understanding the of how neurotransmitter substances work. 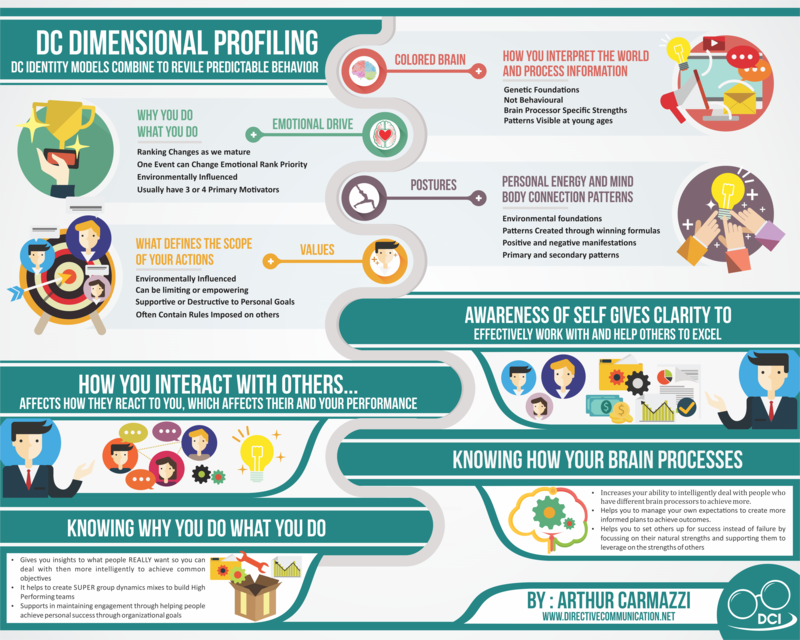 The Colored Brain work began in 2002 from the foundation of multiple contradictive personality focused genetic and observational research, bringing founder, Arthur Carmazzi to discover and focus only on the elements that were consistent among the various contradictive “personality” conclusions. This led to further investigation accounting for the latest neuroscience discoveries to create SIMPLE yet powerful tool that transforms communication and performance. Understanding the genetic communication processes of an individual and the brain flexibility they have developed through their environment and experience, will set the foundation for HR managers and Department heads to maximize productivity of individuals, departments, and the overall organization. 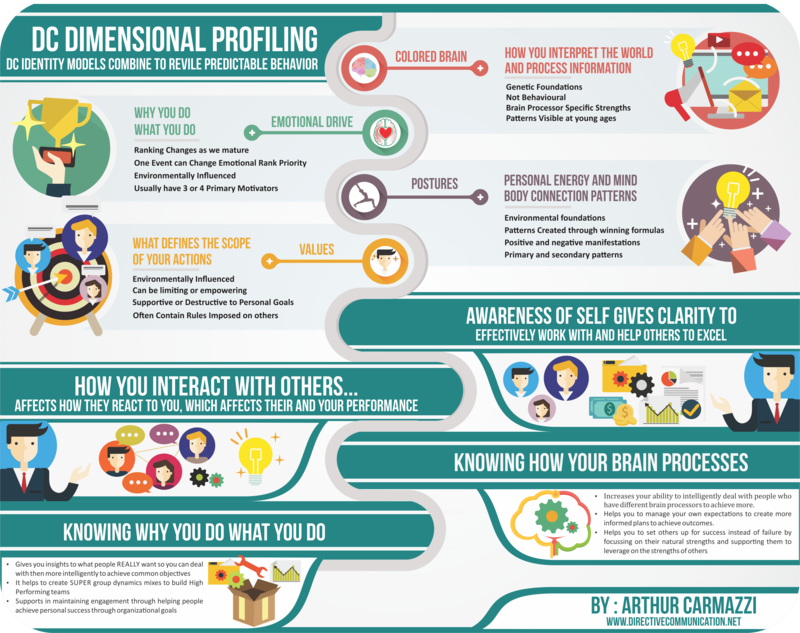 Using the CBCI™ will enable individuals themselves to have a greater understanding of what is required to better perform their jobs, and how to enhance the natural talents in themselves and others. Self scoring to ensure prompt application. Designed to be applied in groups or as an individual. Appropriate for all levels of employees and management. Understanding person’s colored brain in relationships will help you understand how you are going to get along with each other. For example, having the same colored brain in relationship will definitely support better communication, but you are not necessarily going to complement each other. On the other hand, opposite colors will complement each other, but the communication is going to take some extra work. Understanding the colored brain from the very beginning of your relationship will help you achieve supportive and productive relationship with great awareness of limitations. It will also help you understand what is required for maintaining balance and great communication with your partner. Know if an applicant will have the right attitude toward a job or team designation. 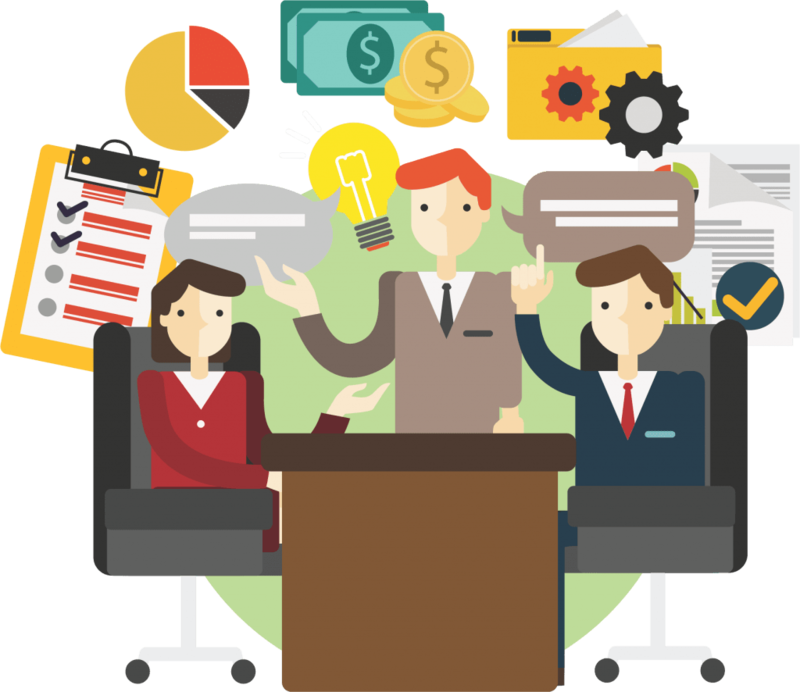 Quantify the leadership potential of prospective candidates. Prevent conflict between team members or employees. Determine an employee’s natural talents and passion to direct their career. 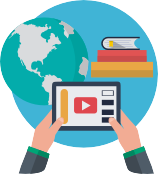 Determine communication processes to improve methods of learning new skills. Suitability to take on new responsibilities. Determine an employees brain and need flexibility for lateral progression. 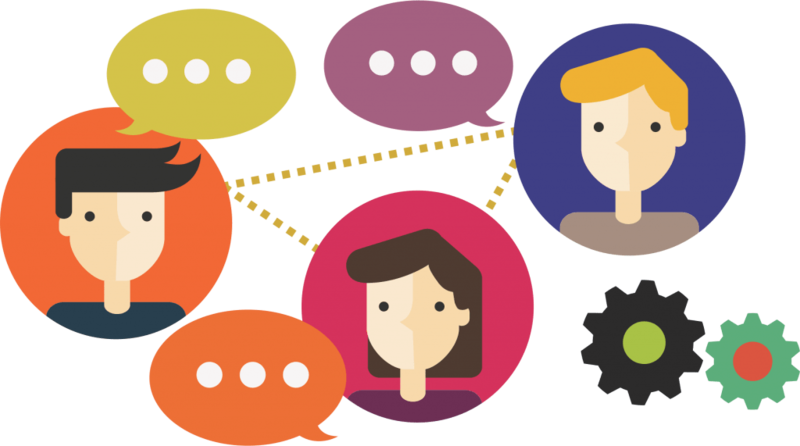 Ability to maintain interpersonal relations within a team. One of the key things that is going to support success of the teams is hiring people, who will add value to the existing team. 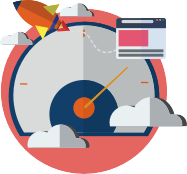 By specifying the team objectives, you will be able to identify what type of people are going to be most effective and support the best performance. You should be able to mix various colored brains to complement their ability to act as a team and achieve the desired objective. For example,Business Development Team would benefit from green brain leading the team, but you would also need the other colors to support from the multiple perspective. Emotional drives would also be an important factor here. These can be found on: Humandrive.net. 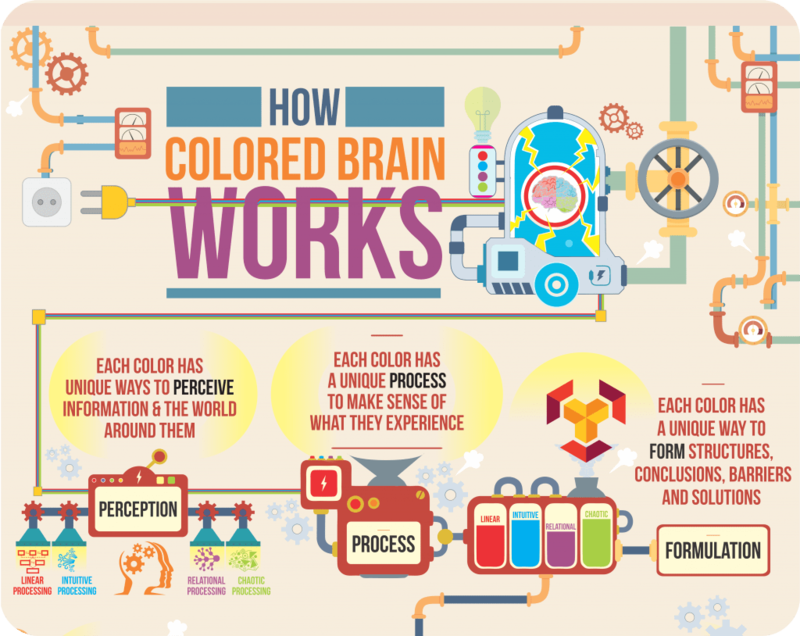 Knowing person’s colored brain will be help you to find the right fit for the project. Knowing that the task is very detail oriented, the last thing you want is someone with a green brain. If the job has multiple facets, you want somebody that has flexibility to look at things from different perspective, like blue or green brain. For dealing with other people, you definitely would like someone who is more empathetic, like blue brain. While for fact and information oriented jobs, for example in accounting or logistics, you would like to find a red or purple brain. This of course doesn’t mean that people don’t have the talent, but what it does mean, is understanding the foundations of their brain processing. You might for example have an amazing green brain CFO, who creatively comes up with new ideas of how to make money, but green brain accountant could not be the best fit. Discovering learning styles in education is a key factor to developing not only the knowledge, but the ability to apply that knowledge. Anybody can memorize anything, but when it comes down to application of knowledge, it’s still a matter of how you interpret it, how you get it. 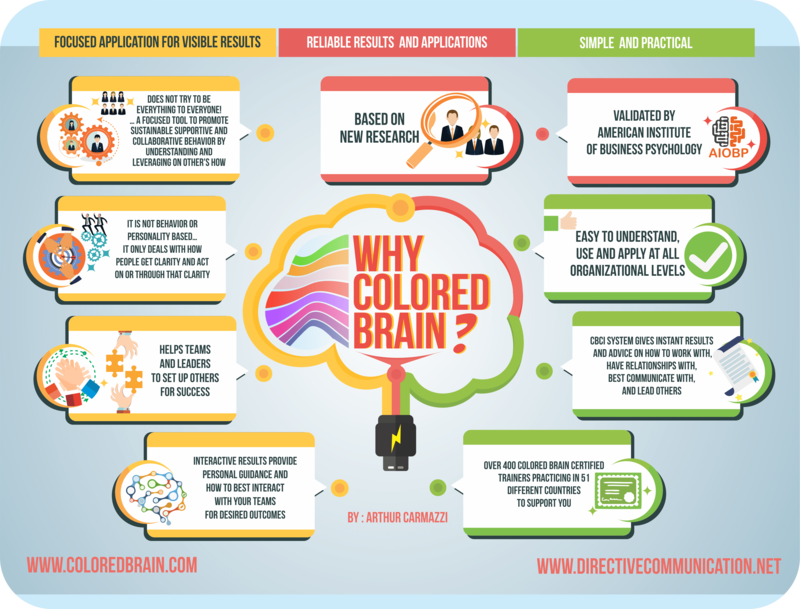 By knowing the colored brain of people who you are teaching or instructing, or even only by knowing that there are multiple colored brains, you can design curriculum’s in a way that will support all the different styles of learning. 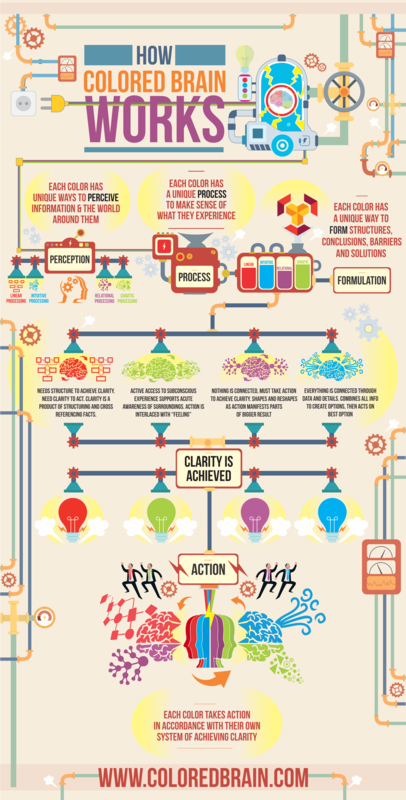 Each colored brain will be able to apply the knowledge more effectively and internalize it more effectively.